[GRAPHICS] My daughter is a 6th grade teacher. An upcoming assignment for her students included making a video for their project involving different cultures. She challenged them to use a green screen effect in the video. The idea is to film themselves in front of something that eventually becomes a “blank background” and then drop in a picture of the culture or country the kids are talking about. They could then create images of themselves floating down the Amazon in Peru, exploring an African savanna or feeding an emperor penguin in Antarctica. Wherever their imagination takes them, they can “appear” to be there! Wow! Can people really be using what seems like a highly technical video “trick” that is used in the film industry … a green screen for their own individual use? It might seem that a good deal of training and advanced software is needed for this technique. Not so! All that is required is a green screen (there are several types), some video editing software and a bit of creativity! Before you think that’s out of your reach, continue to read this article for ways to make it easy for you. You see the use of green (or sometimes blue) screens all the time and may not realize it. For instance, in newscasting, movies and video games, they film a person in front of a green screen and then put an image in the background. That’s how they get Superman to appear to be flying! Also known as color keying, this is a technique where you layer two video clips (or images) together. When you film (or take a picture) on a green screen, you can remove the single-color background and add the image on top of another background video or image. The green essentially disappears so that the top images appear to be part of the background. Why do they use green? Green (and shades of blue) are furthest from human skin tone and easiest to key out of an image or video. Blue is a more common clothing color, so it is used less frequently. TIP: Make sure that the person or items in front of the green screen isn’t wearing green or that part will be washed out! 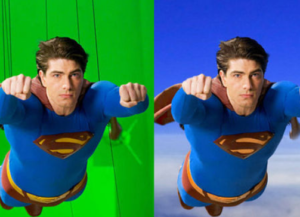 Green screens are used in video pervasively to create visual effects and transport characters to mystical worlds. But using a green screen isn’t just for TV or the cinema. You can create, or purchase, a physical green screen very affordably. When deciding on what type you want to create, consider if you want a head shot (from the waist up) or if you need to capture the subject from head to foot. In the latter, you’ll need the green screen to extend to the floor area. Fabric — All you need is several yards of bright green fabric. The advantage to this flexible option is that you can hang it, or put it on the floor and sit on it. 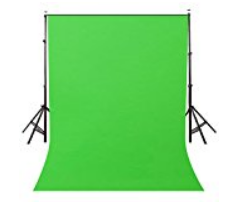 Purchase — Buy a simple green screen for as low as $20 on sites like Amazon. You’ll want a stand or clips to secure it upright for use. Now that you have your green screen set up, here are a few things to consider when filming, or taking a still image. 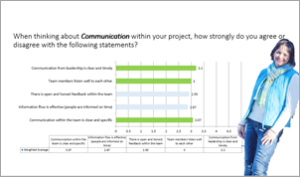 Planning — Pulling out the background isn’t something you do after-the-fact. Be sure to plan what parts of your video you need to do against a green screen before you file. Shot Composition — When shooting, think about the position you’d like the person(s) to be in when in front of the green screen, based on the background image you’re going to use. They could be standing, sitting, or propped up on an elbow. Audio — Use an external microphone if possible. If you are using a mobile phone for recording, make sure that you get as close as possible to the subject. Eliminate background noise. Lighting — Make sure there is a much light as possible and test for shadows that could appear on your green screen. Your green screen should be flat, because folds create shadows that won’t be keyed out. You want extremely even lighting … so bring your subject away from the screen if they are casting shadows. When you are editing your video, you’ll bring in both the green screen track and your background image or video to layer them together. Of course, it depends on what type of video editing software that you are using as to how you remove the green screen color. The concept is to look for the feature to remove a single-color background from the video or image. This can be referred to as remove a color effect, color keying or green screen effect. Walk through the help guide in the software you’re using for specific instructions on layering your media to produce a creative and eye-catching video. If you take a still picture against a green screen and want to layer it on top of a background image, you can do this with software you already have! Both Microsoft Word and PowerPoint have a feature called Remove Background. See a prior Tech-Talk article on using this technique here. Now, you may be thinking that you don’t need to use a green screen with this feature in Word and PowerPoint. However, the flat green background achieved with a green screen is easier to remove and gives a cleaner edge to your image. Give it a try!